← The two classes I’m teaching! I’m working on another star quilt. I’m making it about 3′ x 3′. This will be my entry in the Berkeley Public Library quilt show. It’s not due until late April, so I do have enough time to finish it. 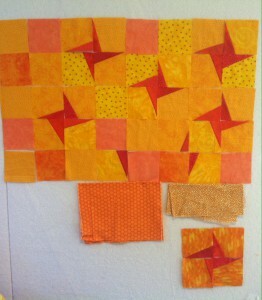 This quilt will be mainly “stitch and flip” stars. I’m trying to decide if the two fabrics at the bottom will work in this quilt, or if they stick out like a sore thumb. The star at the bottom right I’ve already decided to delete from this quilt. The library quilt show will be up from May 1 through June 4 at the central/main Berkeley library, on the second floor. This entry was posted in Improvisational piecing, liberated stars, Quilt Shows, Work In Progress and tagged Berkeley Public Library, Berkeley Public Library Quilt Show, improvisational quilting. Bookmark the permalink.